What can be a better gift than a health care or beauty service! A gift certificate of Kotka Tervisemaja is a practical and suitable gift for your friend, family member, sweetheart or co-worker. Gift certificates can be purchased for €20, €50 and €300 from the clinics that operate in Kotka Tervisemaja (Kotka 12, Tallinn). 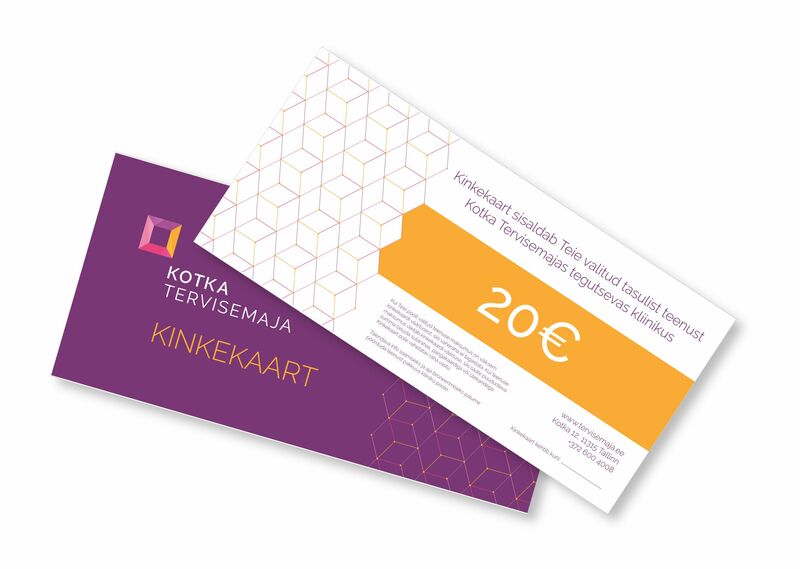 You can use a gift certificate of Kotka Tervisemaja at your own discretion to purchase services in all the clinics that operate at Kotka Tervisemaja. A gift certificate cannot be used to pay for any purchases in the pharmacy or the café. You can use your gift certificate once in a clinic of your choice. If the price of your chosen service is lower than the value of your gift certificate, the difference is not compensated. If the price of the service exceeds the value of the gift certificate, you can pay the difference to the clinic that provides the service in cash, with a bankcard or by a bank transfer. A gift certificate cannot be exchanged for money. You can use a gift certificate in one year from its purchase date. For further information and to book an appointment, please contact the clinic that offers the service you are interested in.